Students just drew thole shapes of hills. 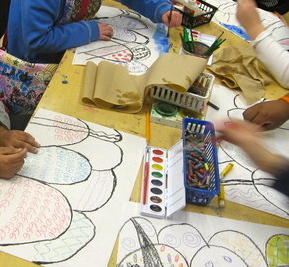 Then, they used crayons to add patterns. 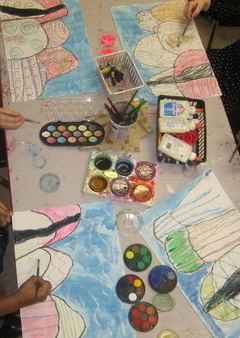 Finally, they painted over the crayons to create a wash with a variety of watercolors. 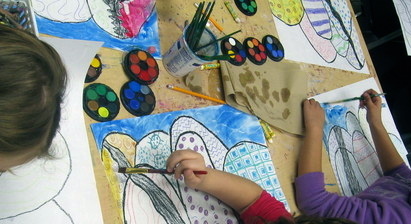 You can see liquid watercolors, regular watercolor cakes, and metallic watercolor cakes. I love the differences in the way these types of watercolors look. The round things are regular watercolor cakes. They are stackable. The wheels screw together. 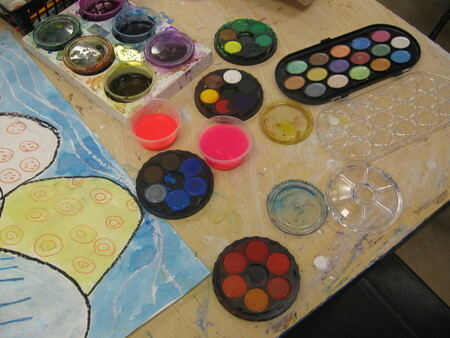 Best thing ever: liquid watercolors in those tiny clear cups from the cafeteria and in a tempera cake tray! Regular ol' watercolor cakes here.